For the third time in four months, the Pending Home Sales Index decreased in November, but has increased year-over-year for 15 consecutive months. The Pending Home Sales Index (PHSI), a forward-looking indicator based on signed contracts reported by the National Association of Realtors (NAR), decreased 0.9% in November to 106.9 from an upwardly revised 107.9 in October, but remained 2.7% above the same month a year ago. The PHSI increased in the South and Midwest by 1.3% and 1.0% respectively, but declined in the Northeast and West by 3.0% and 5.5% respectively. Year- over-year, all four regions were up, ranging from 4.5% in the West to 0.5% in the South. Existing sales declined 10.5% in November. That steep decline was partially attributed to the implementation of The Know Before You Owe mortgage disclosure rule by the Consumer Financial Protection Bureau, and not to a collapse in demand. 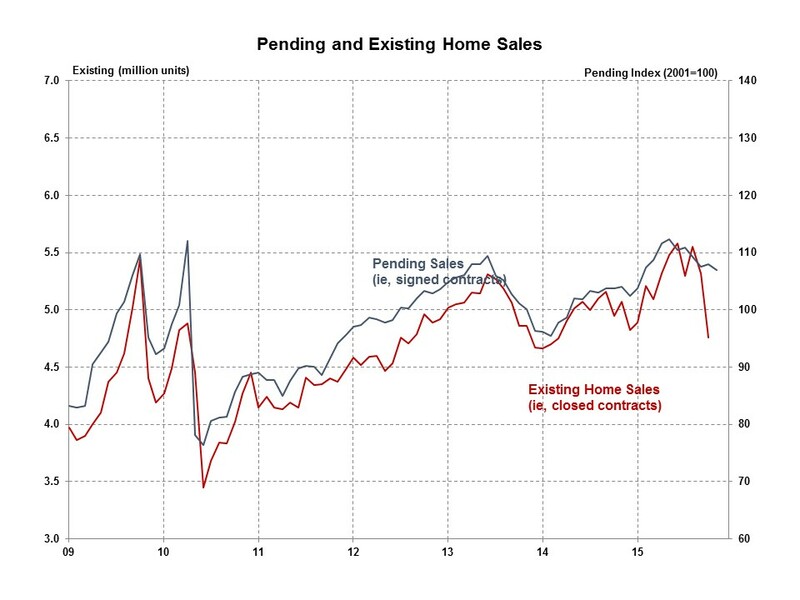 Improving economic conditions and rising employment suggest a continuing recovery in existing sales. However, the long-term weakness among first-time buyers will limit all sales as we head into 2016, and the decline in pending sales inserts a degree of caution. PHSI falling 3% in the Northeast is not good news since the early fall is traditionally the second best selling period of the year. This does not bode well for the winter, especially with interest rates going up.